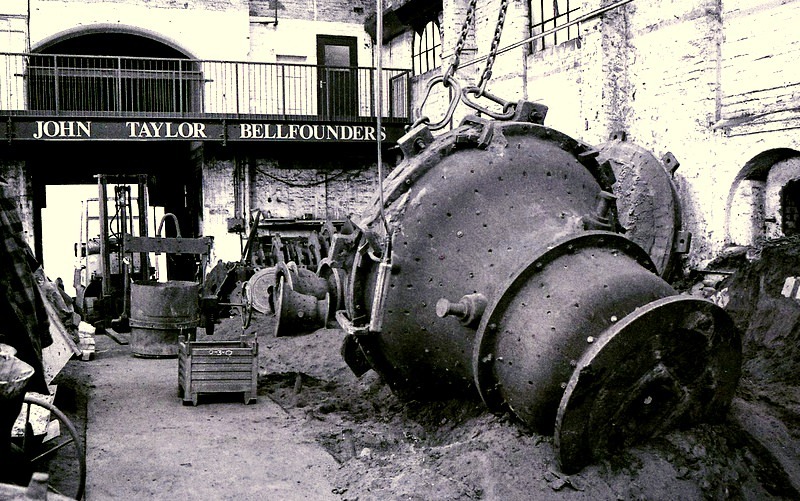 At the Taylor Bell Foundry more large bells have probably been cast than at any other bell foundry in the history of bell founding. 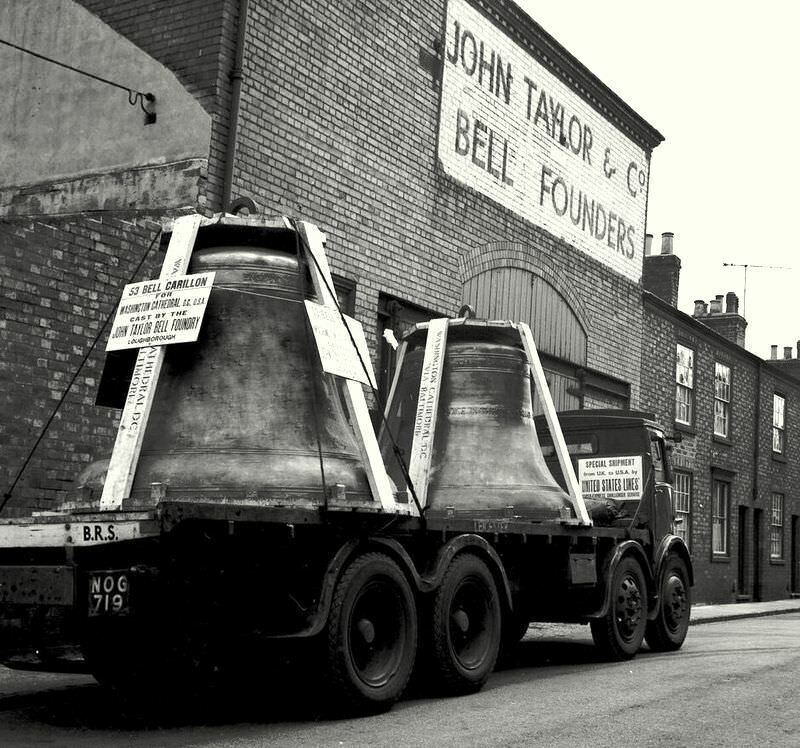 Bells from Loughborough have been exported all over the world. 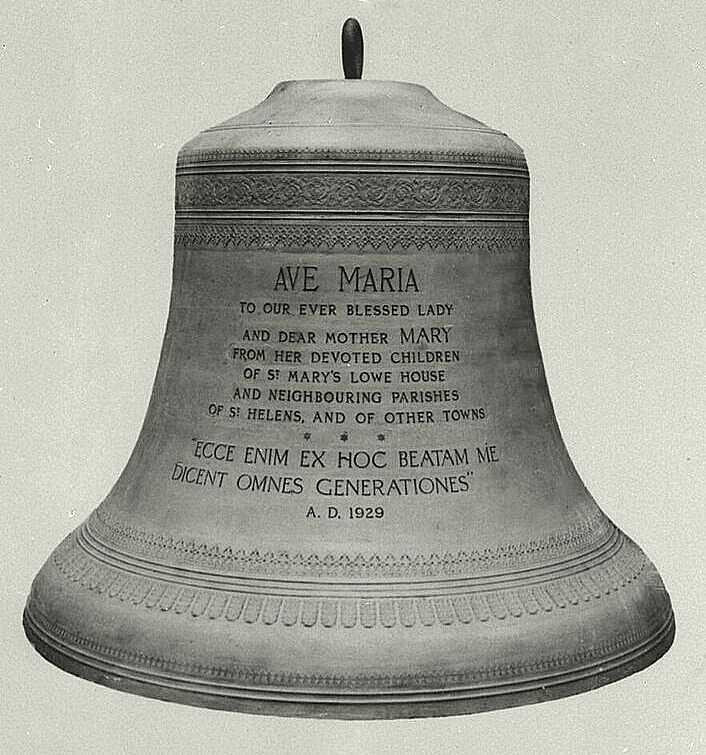 Unlike some other English Bell Founders who have contracted out the casting of such large bells whilst putting their name on them, all the bells listed below have been cast in Taylor's own foundry by its own skilled craftsmen using the traditional skills associated only with English bell founding. We had to decide on a lower weight limit and so have included the bells listed below. 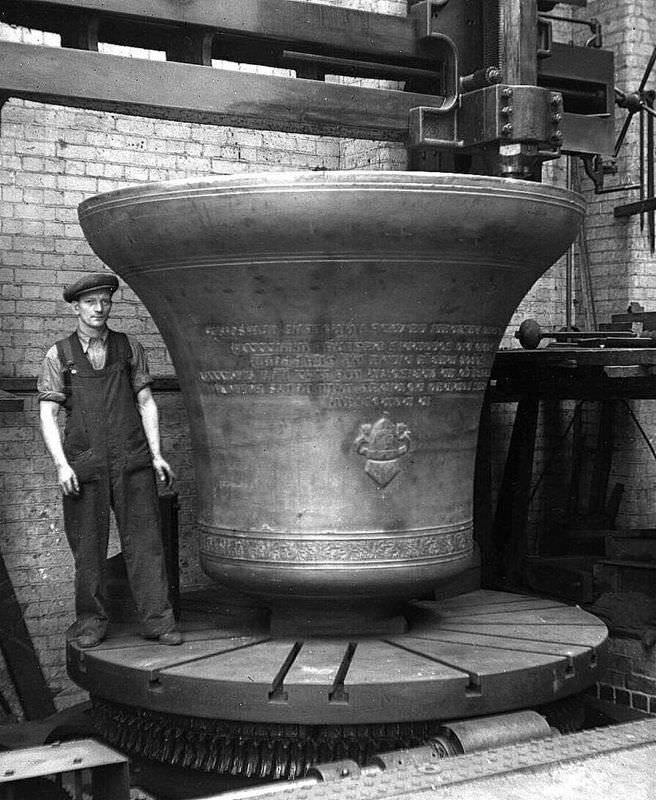 Each bell weighs in excess of 2 tons and we have cast more than two hundred of them at Loughborough! 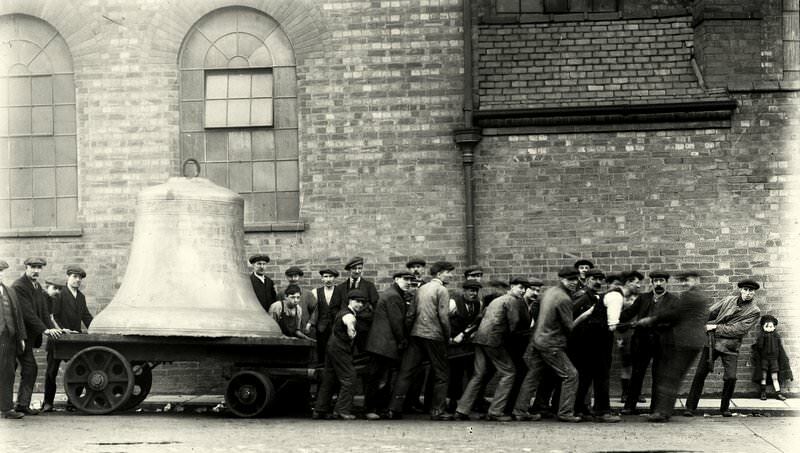 Great George of Liverpool - Nearly 15 tons - Cast at Loughborough 1940. Preparing the moulding case for Great Peter of York Minster - notice the man on the ladder and the two other men in the casting pit- that's a big mould! 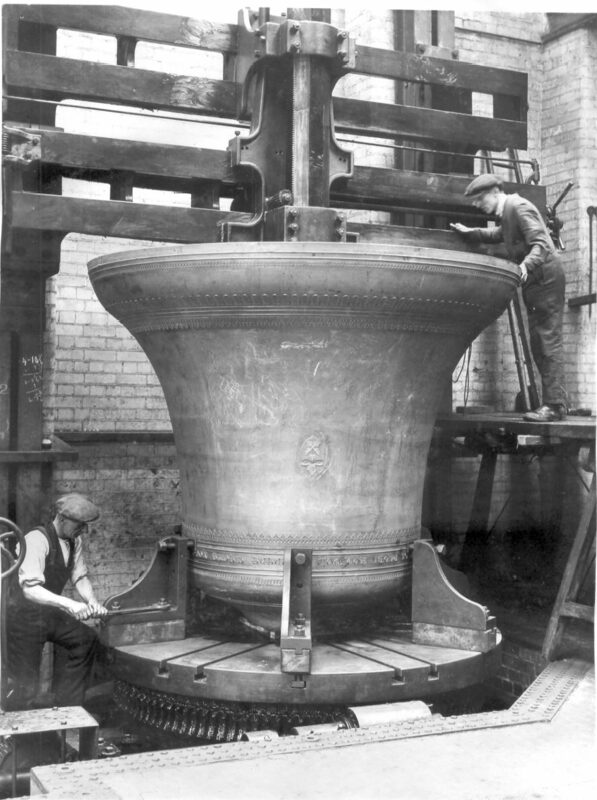 Tuning the newly cast bell on Loughborough's large bell tuning lathe. 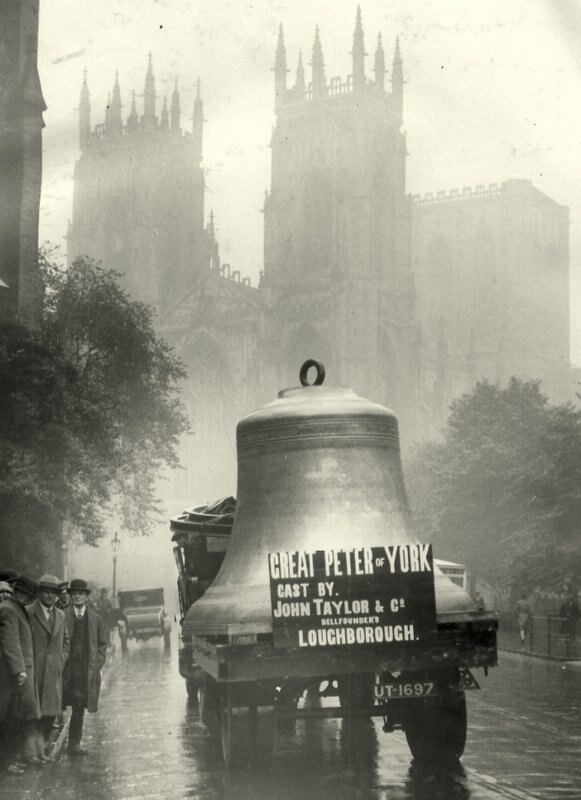 The Great Peter of York on a lorry. The Great Peter of York arriving at York Cathedral. 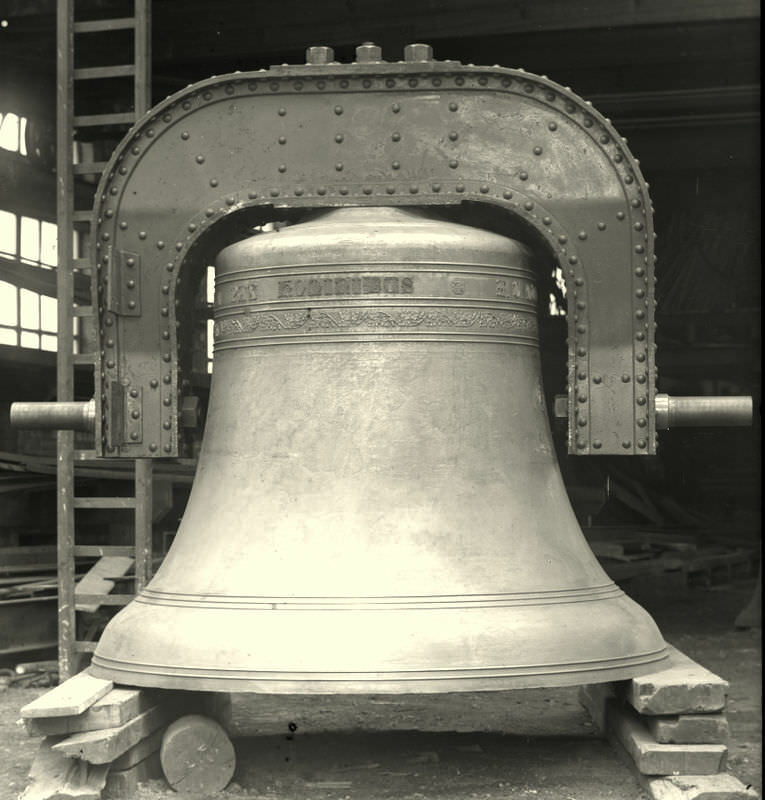 The bell for Bristol University still at the foundry. 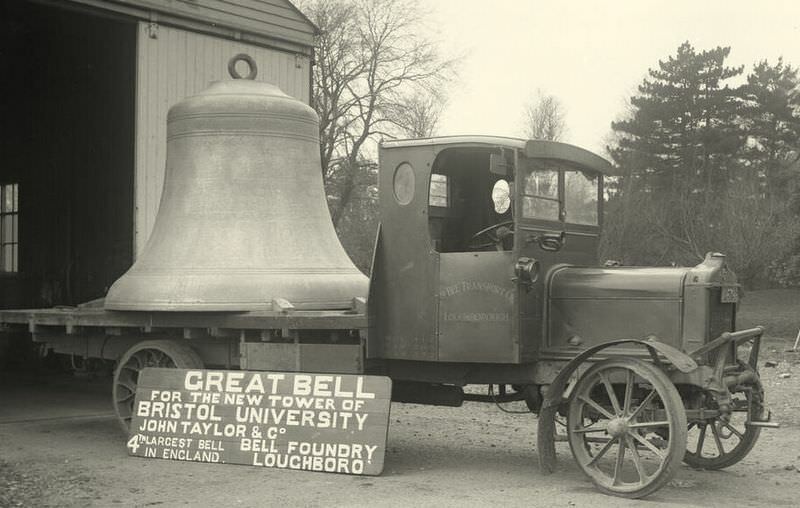 The bell for Bristol University on a lorry ready for delivery. 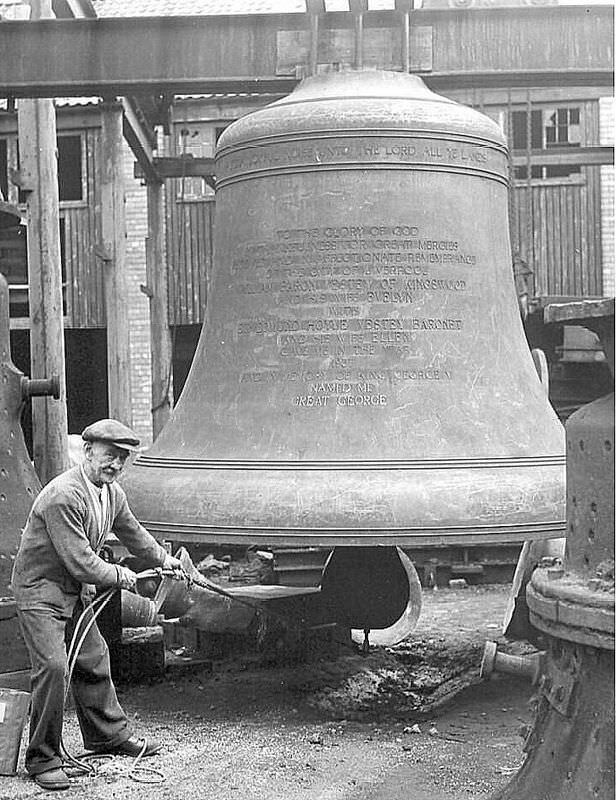 Carillon Bass Bell - St Helen's - A Beautiful Casting. 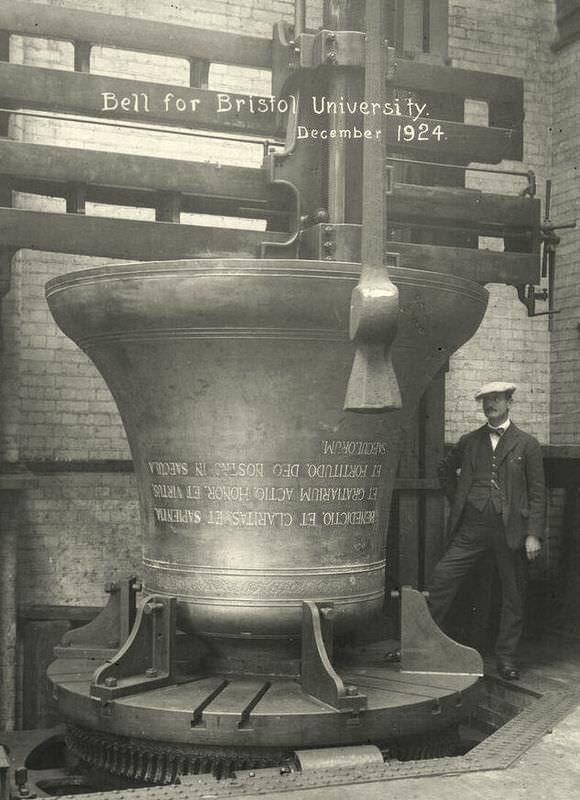 London's "Great Paul" the Cathedral's bourdon bell weighing nearly 17 tons. 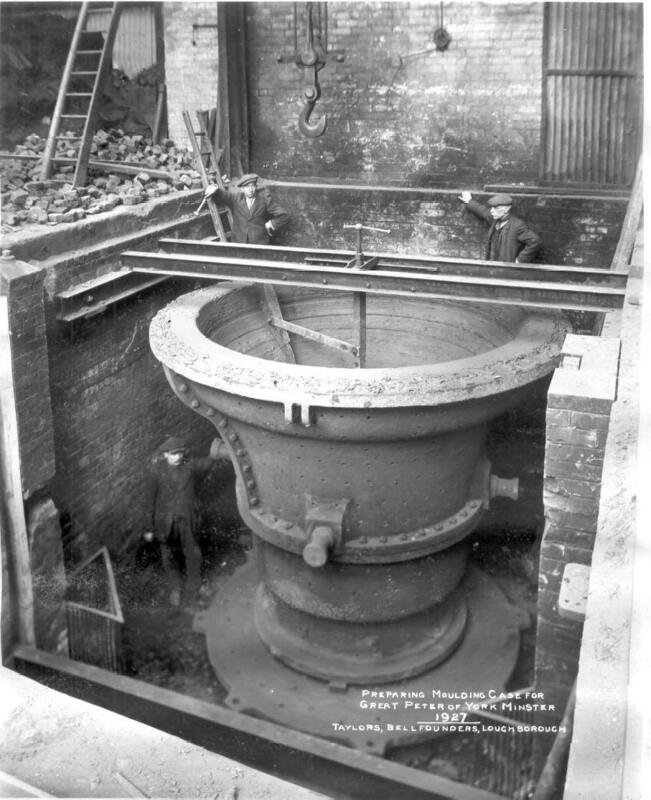 A large bell is cast and dug up - now it waits to be extracted from its mould. 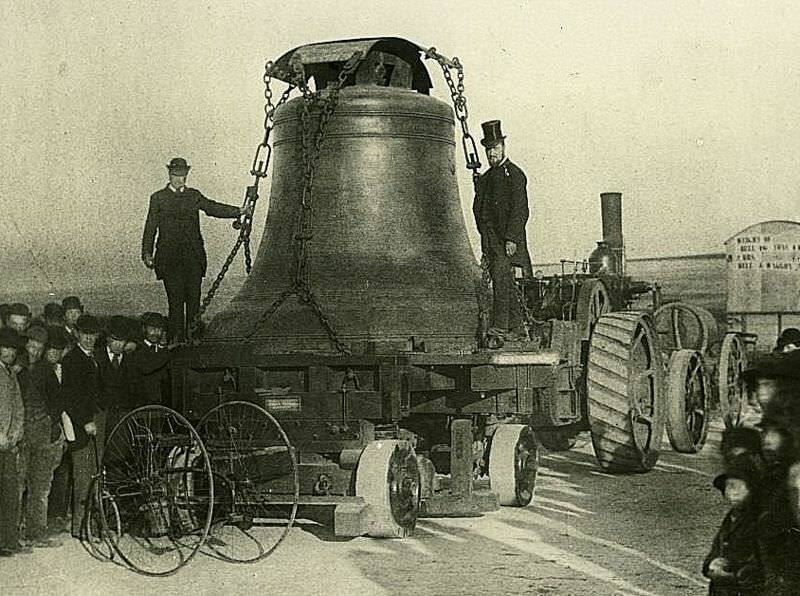 "Great George" - Liverpool's Anglican Cathedral Bourdon weighs 14 tons. 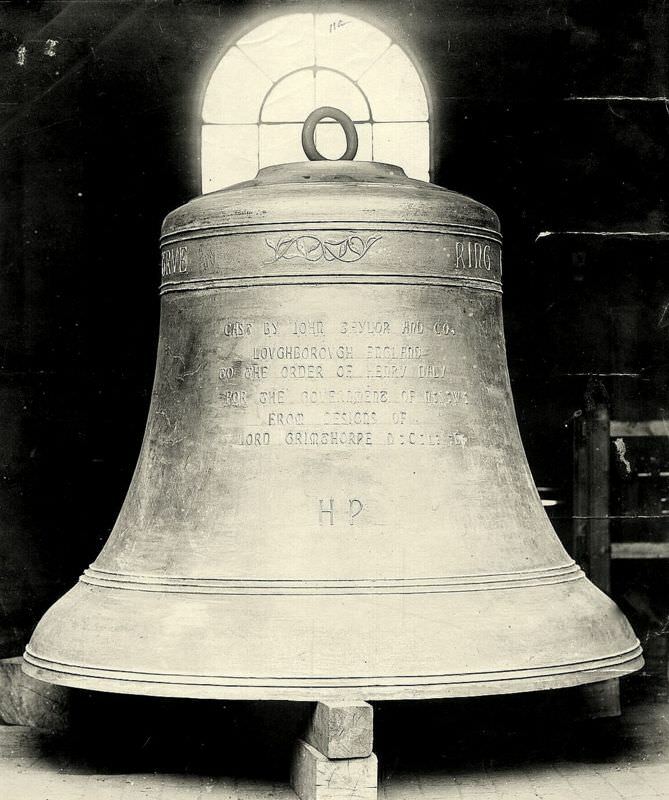 Downside Abbey's great bell was originally cast for Beverley Minster and spent one year there. 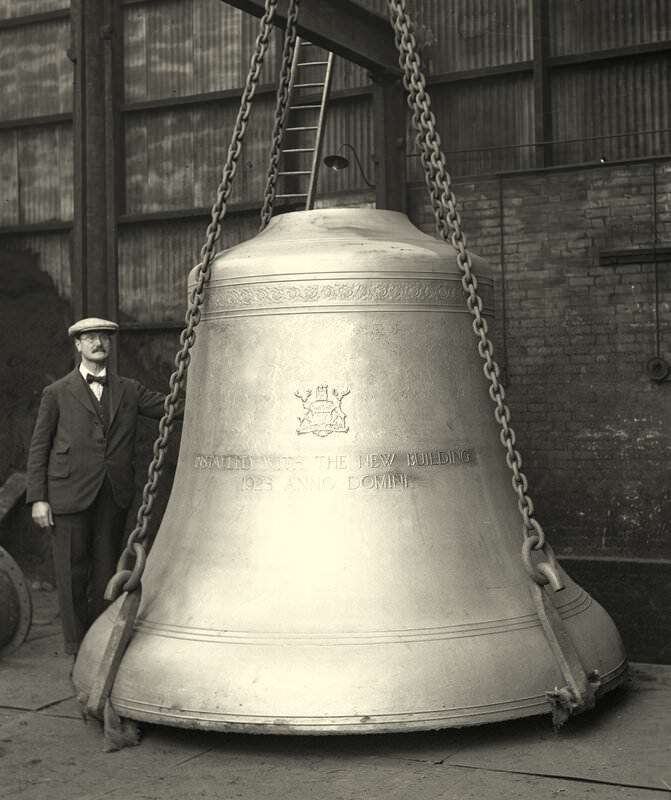 "Little John" of Nottingham - a ten ton wonderful sounding bell. 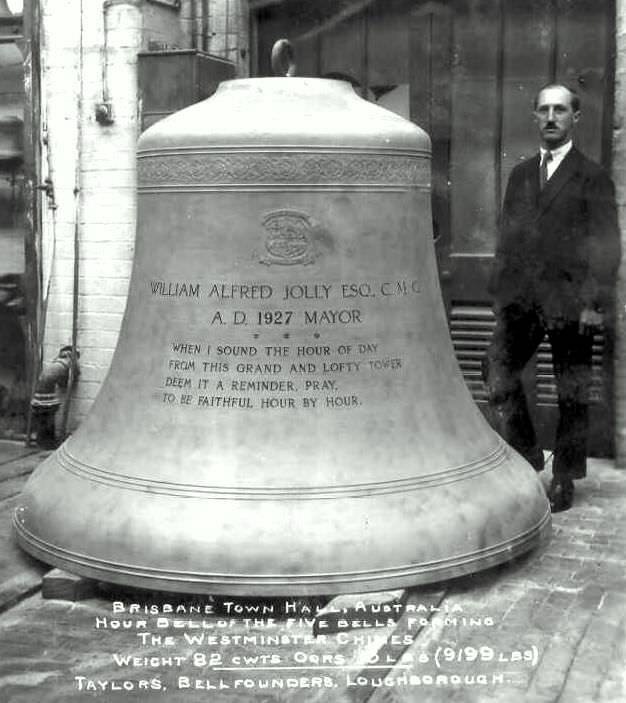 Sydney Post Office Hour Bell. 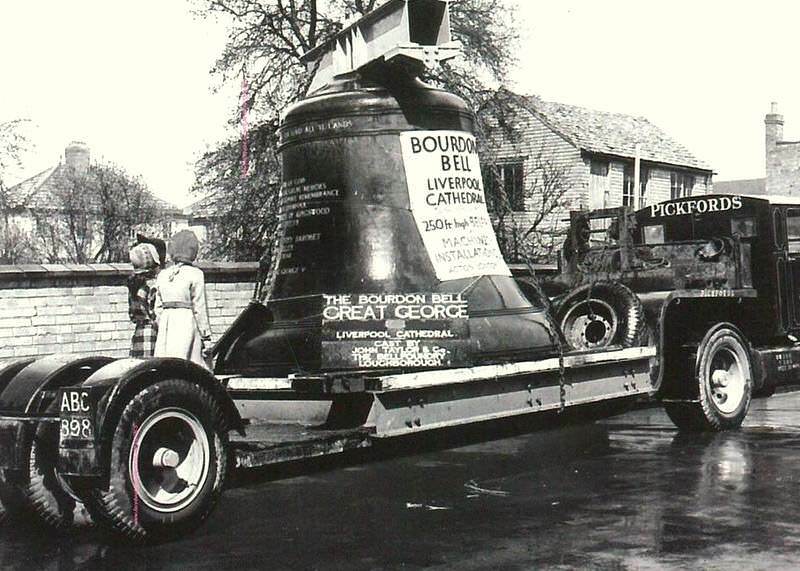 Pulling Yale's 6 ton bass bell along the street in Loughborough. 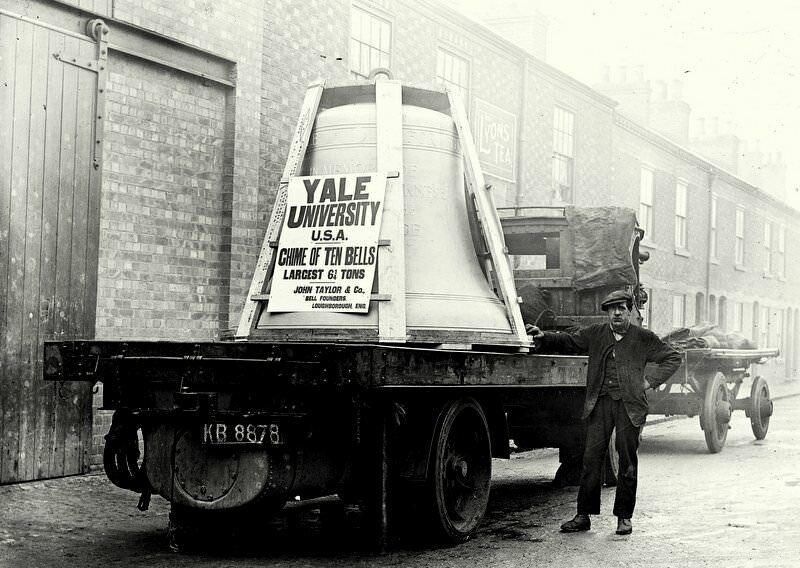 Yale's Bass Bell leaving Taylor's for export. 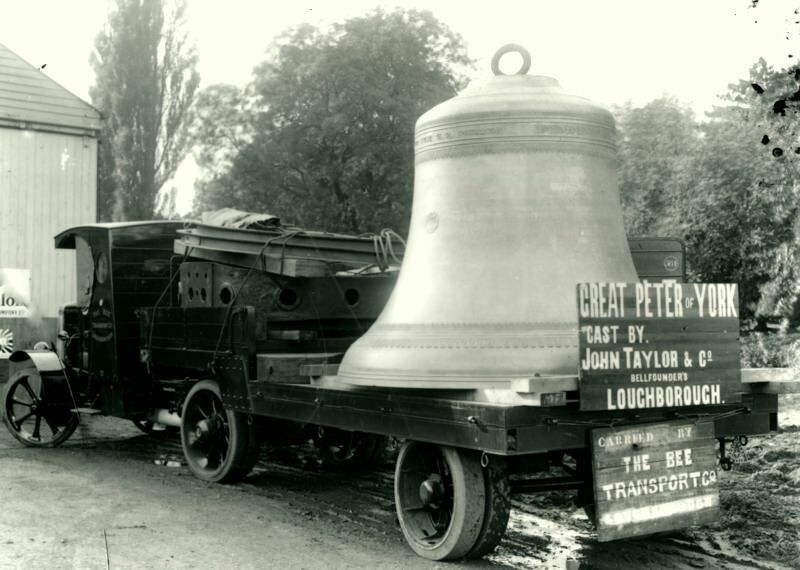 Two of the new bells for Washington Cathedral leave Loughborough - largest 10 tons. 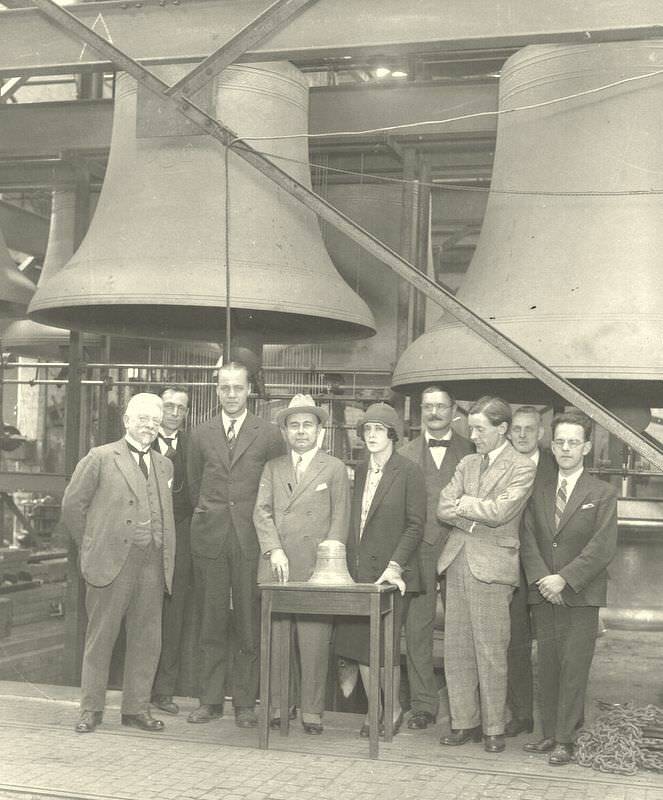 Edward Bok, the donor of the Bok carillon, (wearing the hat) at Taylor's before shipment. On the far left is Jef Denyn, the famous Belgium carillonneur, who came to demonstarte the instrument at the Foundry. 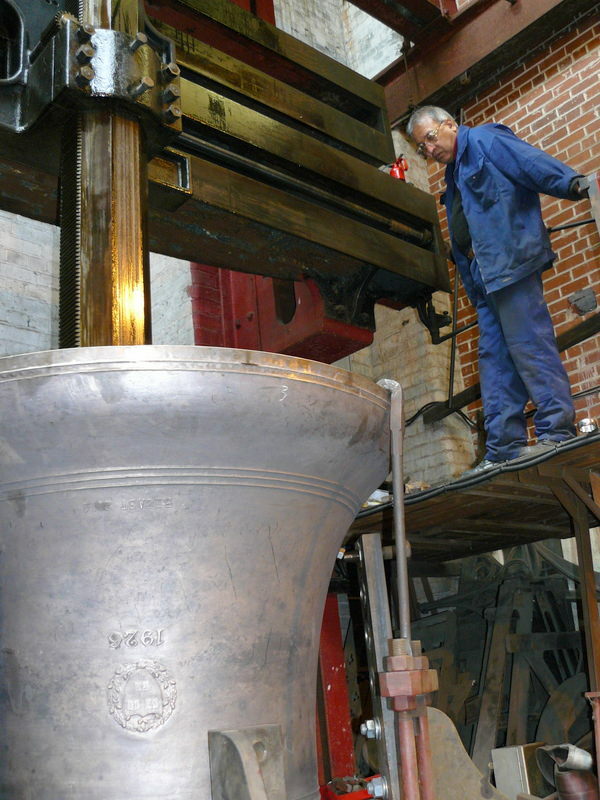 Tuning Harvard's new 2 ton chapel bell at Taylor's in 2014. 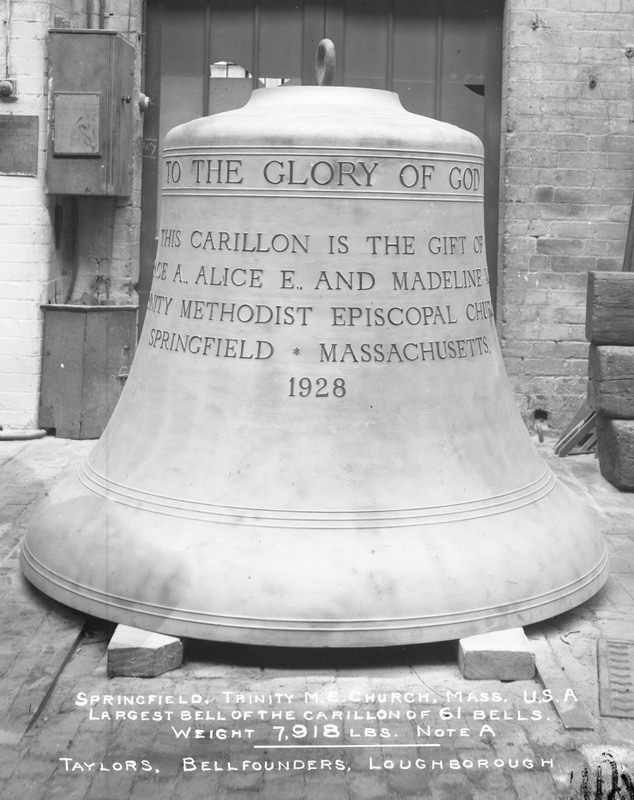 The largest bell of the Springfield Trinity Church carillon of 61 bells. 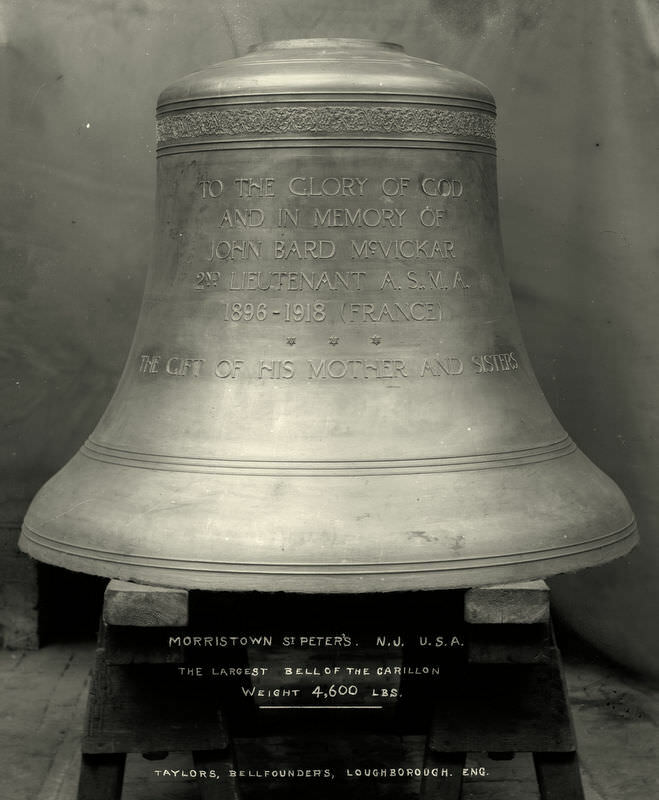 The largest bell of the Morristown St Peters carillon. 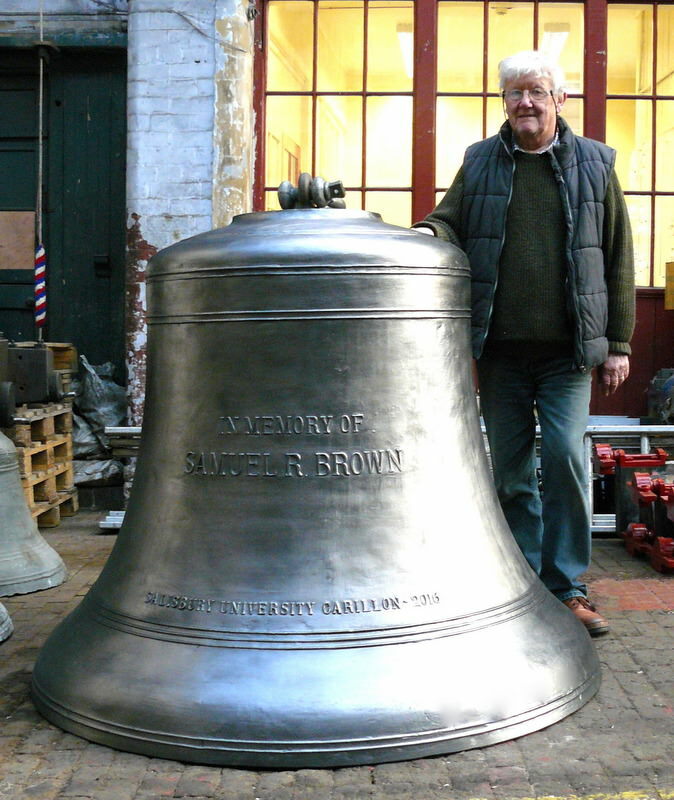 Salisbury University's 2 ton Bass Bell - Cast at Loughborough, England in 2015. 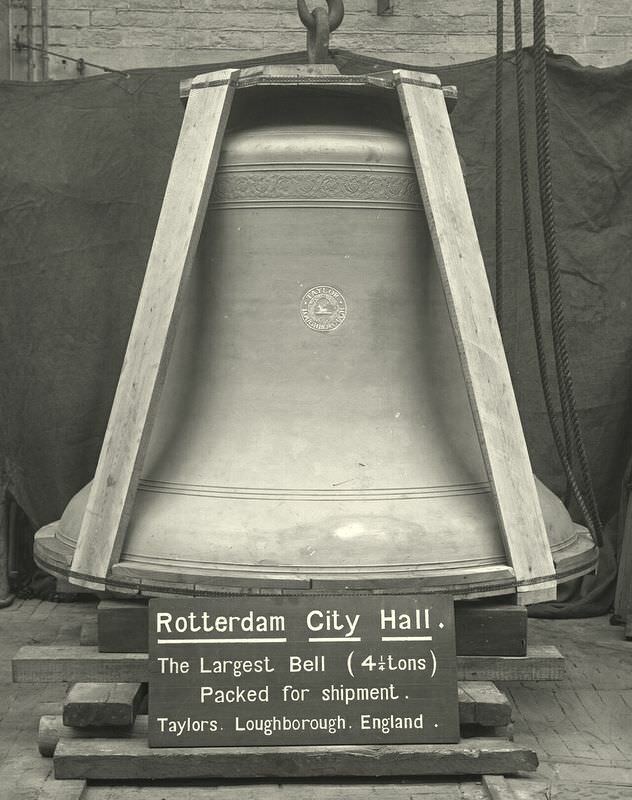 Rotterdam City Hall Carillon Bass Bell. 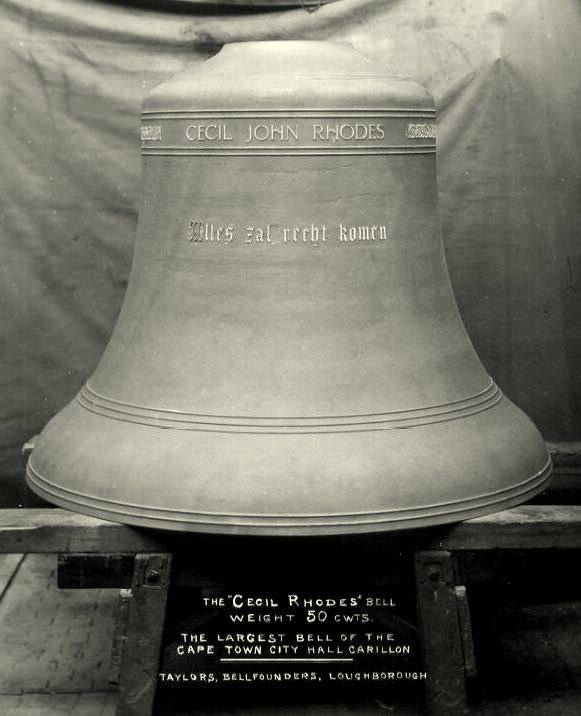 The Cecil Rhodes Bell for City Hall, Cape Town. 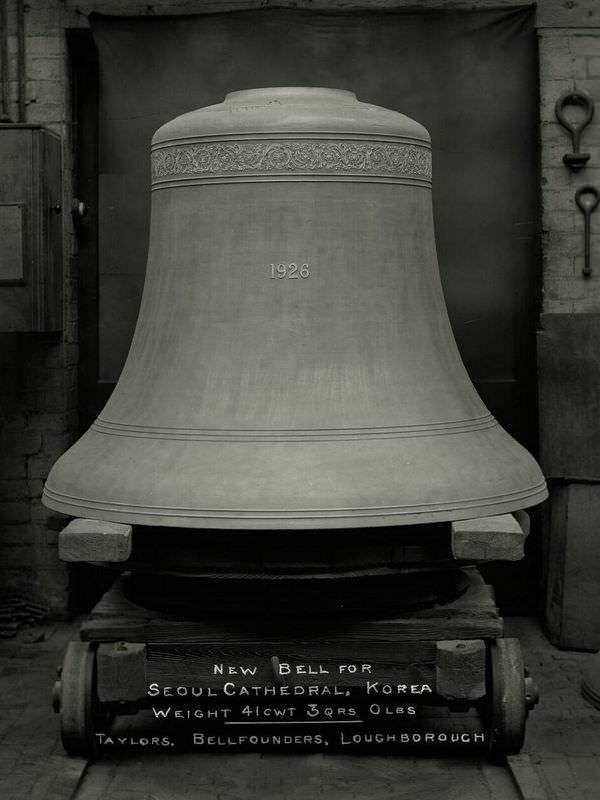 The Cathedral Bell for Seoul.